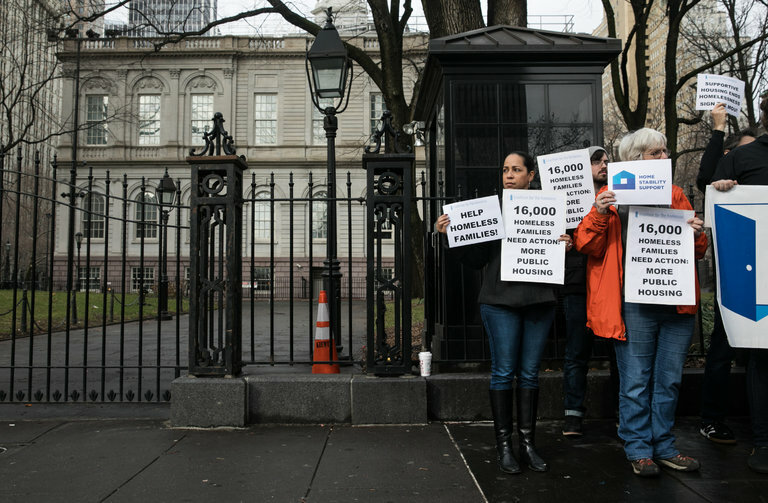 It can’t be said enough that New York’s homelessness crisis is complicated. In a city where people are squeezed beyond their means by rising rents, just one of any number of additional stresses — a lost job, sickness, addiction, domestic violence — can propel a family into the shelter system or the street. The problem won’t be solved by flooding the city with shelter beds, though more are needed. It certainly won’t be solved by blocking City Hall’s shelter plans, as New Yorkers in neighborhoods like Maspeth, Queens, have stridently done, demanding that these families go suffer someplace else. Protesters seem to think that poor people can be harangued into making the rent. The current crisis requires bigger, bolder solutions, and Assemblyman Andrew Hevesi is proposing one. It’s a plan to create a statewide rental subsidy to help families on public assistance stay in their homes. The program, called Home Stability Support, would help bridge the gap between the shelter allowance for public assistance recipients and market rents. Families who face eviction or are forced to move because of domestic violence or hazardous living conditions need a sturdy bridge to permanent housing. But existing aid often isn’t enough to help them avoid the shelter trap. Mr. Hevesi’s proposal would use state and federal funds to supplement a family’s shelter allowance up to 85 percent of fair-market rent (localities could add their own funds to raise that to 100 percent) and would help pay for heat, if heat is not included in rent. The tab might seem high up front — about $11,000 a year for a family of three. But it’s a bargain compared with the public cost of nearly $41,000 for that family in the shelter system now.